It has been said that what you wear on your feet says a lot about you. If that’s true, then you may soon be considered smart simply by the choice of your footwear. That’s because a Samsung spinoff company known as Salted Venture announced a line of smart shoes for golfers and the fitness minded that will soon be available to the public. The announcement came back in February, but the launch date is quickly nearing with preorders already commencing. The launch of the shoes comes via a Kickstarter campaign where they have already far exceeded their $30,000 goal. Golfers have a lot to look forward to come February 2017. That’s when they can hope to receive the new IOFIT, the world’s first smart shoes said to “help golfers quickly and smartly improve their game while having fun.” As you’d expect, the shoes work with an app. 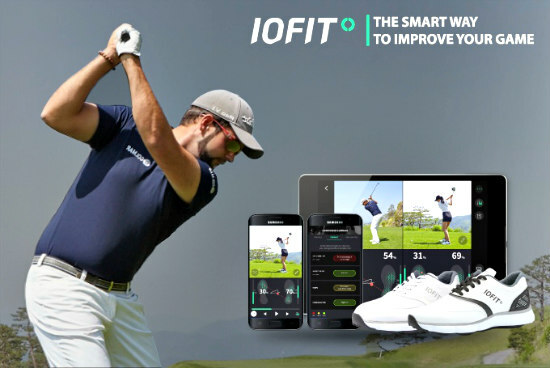 IOFIT golf shoes will analyze your swing and then provide instant feedback (courtesy of your smartphone) in an attempt to improve your game. According to the information on the campaign page, the smart shoes are capable of measuring your balance and weight shift in real-time using “extremely thin pressure sensors embedded in the outsole. The data is then wirelessly transferred using Bluetooth. The IOFIT sensors were designed to “accurately detect every subtle change in the pressure distribution in a matter of milliseconds.” The sensors are waterproof and purportedly built to withstand up to 330 lbs. The shoes come in two styles. One resembles a suede oxford tennis shoe, the outward appearance of which is actually pretty appealing. 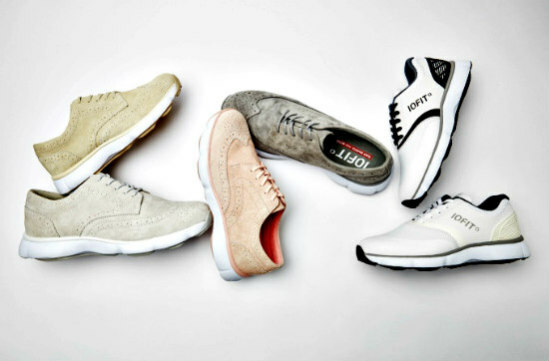 The other style more strongly resembles a sneaker, albeit a modern golf-shoe-type sneaker minus any cleats. You have to remember, however, all the IOFIT smart shoe can do is tell you what you’re doing wrong in your game. They’re not a panacea. The rest is up to you. While reviewers of the golf shoes have voiced the opinion that they found them to be surprisingly effective, the other line of smart shoes by Salted Venture hasn’t been as widely examined or discussed. That may be because the fitness smart shoes aren’t expected until later in 2017. In all probability they will offer similar analytics but geared for fitness activities. One could assume stride, distance, rate of speed and maybe even calories burned may be part of the available data users would find useful. Whatever it is, they are sure to come with a similar price tag as the golf version, which is upwards of $300 to $400. Sites like Kickstarter, Indiegogo and GoFundMe have made it possible for countless entrepreneurs to realize their dreams. Salted Venture’s IOFIT Kickstarter page is loaded with images, “about” info and even videos for anyone who just has to know more about the data relayed and the shoes’ durability and performance aside from the metrics aspect. At this point, a pledge of $189 will get you an early bird deal on a pair that knocks more than 50 percent off the retail price. Pair them with the smart golf club that debuted on Kickstarter last year, and you may just have something going on the links in 2017. Design Our Home Among The Stars For The 2014 NASA Space Settlement Contest! Facebook, So Long, Farewell, Auf Wiedersehen, Good-bye!